This blog is devoted to photographs, not data, but hey, “all media are mixed media,” so let’s not forget about our friends in survey research. 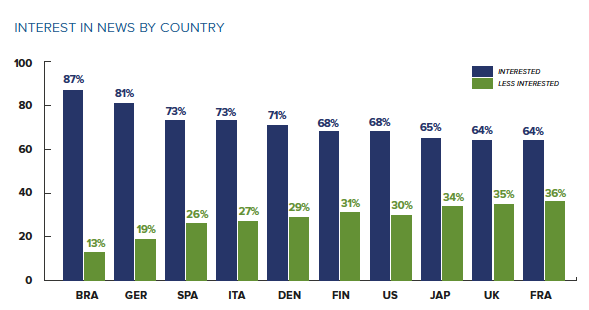 The Reuters Institute for the Study of Journalism has released its Digital News Report 2014. You can see summaries in various media at the website, or download the entire report. For video of a discussion of the report in the UK, go here. That video had received 20 views when I was there, so it’s not yet a hot item. Perhaps a good photo would help. . . . Yesterday the Dow Jones Industrial Average hit an all time high. Yet, as the New York Times reported, the response was relatively muted. There probably are several motives for being wary of the results, but one of the better reasons is that the good times on Wall Street are not quite so evident on Main Street. 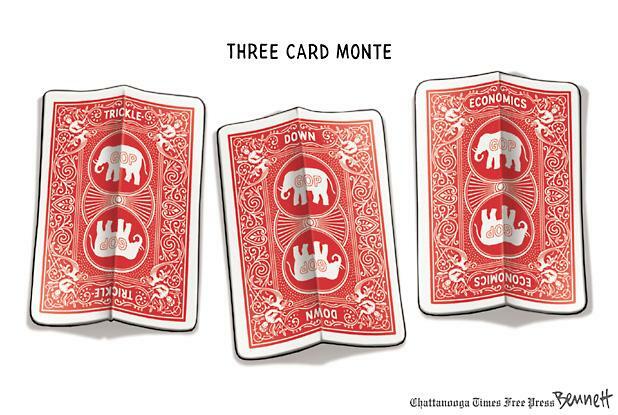 As the Times noted, “The strength of the stock market is not strongly reflected in the real economy. Consumer confidence is well below the level it hit during the last high in October 2007. The unemployment rate was then 4.7 percent, compared with 7.9 percent now.” Not to put too fine a point upon it, but the Dow need not reflect the “real economy,” which would be the one that actually employs people. People, that is, who then can make a living, have less need of social welfare funding, and pay taxes that can fund the government and reduce the national debt. Instead of assuming that all boats rise with the tide, we now need to think more carefully about how the labor and capital might or might not work together. The Times phrasing is instructive: there is the real economy and a virtual economy, and they are somehow close to one another and yet not necessarily working together or benefiting the same people. Not an easy thing to understand, which is why I like this photograph. 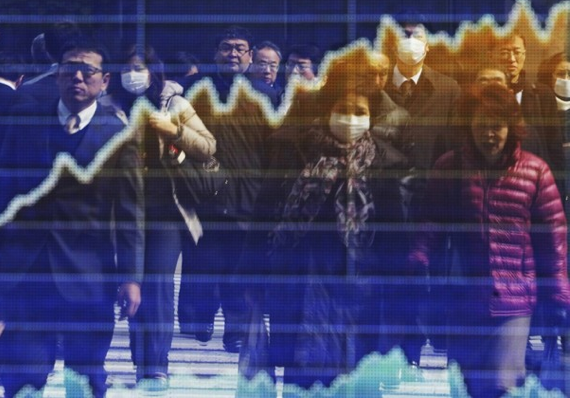 It’s from Japan, not New York, and the white line of the graph is from the Nikkei exchange, not the Dow, but these details are not relevant to what is being shown. The data and the people on the street are both reflected in a brokerage window–a transparent surface that, through the photograph, becomes a medium for reflection. The image, like the reality it represents, is ambiguous, for it presents both dream and reality. On the one hand, labor and capital are seamlessly integrated into a single system. In that system, the relatively abstract, fluid investments are backed by the labor they fund and organize, which in turn prospers from that investment to acquire the many benefits of modern life–benefits such as good clothing, shelter, health care, transportation, communications, and all the rest. That’s the dream, which has been realized more often than not. Oh the other hand, the photo also suggests that labor and capital can become strangely alienated from one another, so much so that the “real” work, lives, and interests of most people can recede behind a screen of financial activity that moves upward while they become increasingly secondary, ghostly, unreal. Indeed, they almost seem to be behind bars, as if crowded into a camp where they will become increasingly unknown, unheard, impoverished, and forgotten. In the process, “all that was solid melts into air,” and real and virtual realities change places. As in the photo, capital superimposes its image on labor, creating a society that has the form of a palimpsest, with the older values and social contract covered over by another picture priced to sell. That doesn’t have to happen, but it is happening. The more that profits are disconnected from jobs, and the greater the disparities in income within corporations and societies, the more the virtual economy displaces material benefits. One reason it need not happen is that the same policies can benefit both capital and labor: for example, stimulus money from the Fed and other central banks can both support investment and create jobs. But that’s not a market solution, which is a problem in some quarters. So look again at the photograph: those white masks are another example of what happens when the side-effects of economic development are not checked by government regulation, and the fatigue evident on some of the faces is another clue that being driven by capital can have very real consequences that are not reflected in stock market data. Another reason the virtual reality metaphor is so compelling is that a host of conservative pundits have been predicting an Economic Doomsday ever since Barrack Obama took office, and those dire warnings are repeated as fact again and again in online comment threads by lesser writers who insist that Obama has “wrecked the economy.” Yes, the economy was wrecked–in the final year of the Bush era, because of unrestrained greed and folly on Wall Street, and then kept that way for too long due to conservative pressure to reduce government stimulus policies. And Wall Street is prospering now because of the 4 trillion dollars the government provided to save the financial system, but don’t call that big government, or a stimulus, or money given to a bunch of takers who will only develop a greater sense of entitlement (as is said of all social services spending). In short, the ideologues’ history and judgments regarding the use of government monies are part of a virtual reality game very different from what actually happened. And why should they do otherwise if they never are held accountable: if you batted 0 for 50 in most leagues, you wouldn’t be sent back to the plate, but in Fantasy Politics you can have the same record and be the designated hitter. One reason verbal illusions may be so easy to reproduce is that it is hard to visualize economic processes, and particularly those processes that involve inversions of value. But they can be visualized, at least in part or through a glass darkly, if we take the time to look. Photograph by Yuya Shino/Reuters. For earlier posts on photos that superimpose financial data on human beings, go here, here, and here. 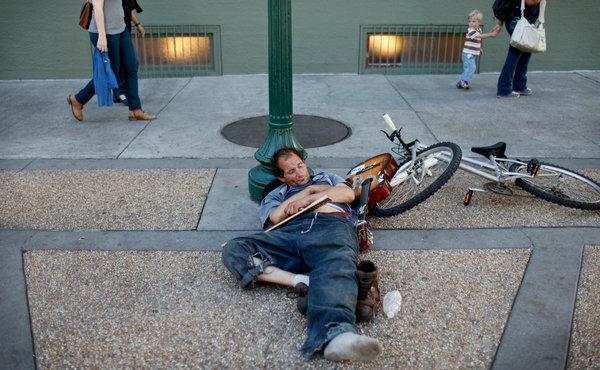 On any given night there are more than 600,000 homeless citizens of the United States who do not have indoor shelter. Most live in urban communities and are consigned to finding places to sleep wherever they can, beneath bridges or in parks, alleyways, and culverts, sometimes in tents and sometimes not, sometimes in cars and sometimes simply on public streets and walkways. Their presence is often perceived by those not so unfortunate as a public nuisance and so, not surprisingly, there has been something of an explosion of laws nationwide that criminalize all manner of behaviors which penalize people for being homeless. The assumption, it seems, is that we can address the “problem” of homelessness by making it more or less invisible in public spaces, and if we can’t do that then we will at least label it as deviant by making it illegal. It is not entirely clear how effective such a strategy might actually be, since such laws are typically not accompanied with sufficient alternatives to “house” or otherwise accommodate such individuals. But there is a larger problem, for it assumes that homelessness is a moral aberration that somehow mitigates one’s rights as a citizen to occupy and utilize public spaces. 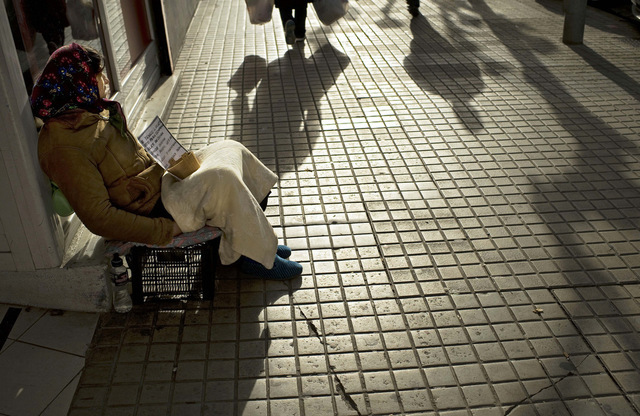 The issue is not whether the homeless are “deserving” or not of their condition, nor for that matter whether their very presence undermines economic commerce in certain areas or neighborhoods, but whether a liberal-democratic society can function effectively by refusing civic (or human) rights to citizens on the basis of their socio-economic status. Put differently, it seems likely that the condition of homelessness is not about to go away anytime soon—indeed, as some have argued it is endemic to the social, political, and economic worlds in which we live—and its not clear how the polity is served by treating the homeless as a group whose civil rights are nugatory. The man sleeping on a public street in Berkeley, CA in the photograph above has been homeless for ten years and it is not likely that his condition will change anytime soon. Declaring him a criminal and denying him access to the public parks and streets does nothing to address either the “problem” of homelessness or to promoting a democratic culture predicated on egalitarian principles. At their best, such laws simply cast the homeless as scapegoats for a situation with which we are otherwise uncomfortable, and thus making it less visible to the public gaze. But even at that, we have to recognize that, as in the photograph above, there will always be those like the young child who stare cannot be fully controlled. How much better might it be to imagine the homeless as citizens and to accord them the basic right to be in public spaces? * Know When to Walk Away, Know When to Run! It’s not a particularly good photograph, but it’s spot on as a metaphor for Republican ideology. 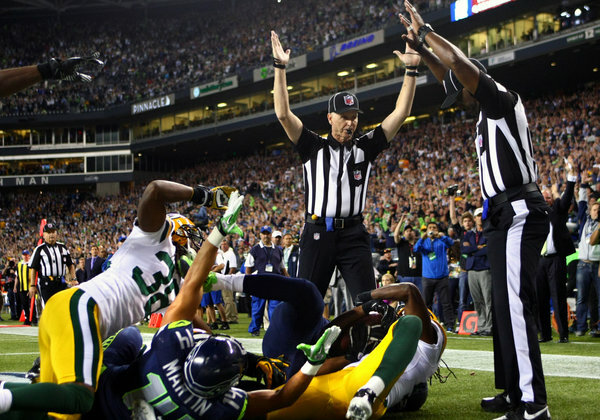 The caption could read, “Scab referees blow the biggest call of the Seattle-Green Bay game.” One of these replacement workers is signalling a touchdown, as if the Seattle Seahawk receiver had caught the ball, while the other one is signaling a touchback, as if the Green Bay Packer defender had caught the ball, which he did. Earlier in the play, the receiver had committed offensive interference, which was not called. I probably don’t need to mention that this was the final play of the game and that it decided the outcome. The reason competent referees are on the field is that the NFL owners have locked them out. Anyone can do their job, right? Well, no, not even close. The lack of competence and the corresponding deterioration of the game has been evident from the start, and it has gotten worse, not better, as the weeks have gone by and the stakes have gotten higher. Monday night’s incident may break the stalemate, as now Everyone is incensed and saying so. I hope the pros are let back onto the field, but once that happens a teachable moment will be over. What the referee lockout demonstrates is nothing less than the stupidity of excessive deregulation. Referees are regulators, after all: nothing more and nothing less. And their work is very important: if the players (and coaches, are you listening New Orleans?) don’t follow the rules, you don’t have a more aggressive or competitive or entrepreneurial game–you don’t have a game at all. More to the point, those who are watching the game–people like spectators and investors–lose confidence in it and go elsewhere. So, the refs need to be there, and they need to be competent and have sufficient enforcement power and have adequate resources such as good salaries and pensions so that they can work effectively and without corruption. When they work well, you largely don’t see them, although someone is always a bit aggrieved because they got caught, and everyone can prosper. When they don’t work well, just about everybody loses. Business culture loves to compare business to sports. The CEO is the quarterback, we’re all on the team, discipline and hard work and uniforms are expected, . . . you know the score. But the comparison disappears the minute government regulation comes up. Then we are to pretend that no rules are necessary, that any regulators should be underfunded lest they become tyrants, and that rules benefit only the weak and not the strong. Tell that to the Packer who actually caught the ball. As a friend likes to remark, we need fair markets, not free markets, because there is no such thing as a free market. The choice is between fair markets and unfair markets, good referees or putzes. Only then is the better athlete likely to win, and only then can other people trust the game. Which brings us back to the photograph. It might seem to be a bad photo, and certainly so by the standards of sports photography. The focus isn’t on the players, who are clumped awkwardly after the play has ended. The refs call for attention, but because one is looking at the other whose face is obscured, the focus is diffused there as well. And then there is everything and everyone else: the background is packed with other figures, tiered masses of spectators, stadium decor and signage, and even a stray hand waving in the upper left. Contrast this with the daily output of high definition, close-cropped, freeze-framed dramatic clashes and balletic action shots, and there’s no contest. Nonetheless, it’s a good photograph. As we’ve noted elsewhere, photographing economic realities may require giving up other aesthetic conventions to get inside banal, ordinary, everyday experience. That’s where the work is, and that’s where the damage is done when the Lords of Finance and their ideologues rig the game. By capturing how the decisive competitive moment actually depends on competent application of a set of rules, and how not just the few players but the general welfare benefits from fairness, the photograph provides a lesson in how a modern society should be governed if it is to have sustainable prosperity. And so maybe life is like sports. If you want to enjoy the game, there have to be rules and people paid to enforce them. If you’re not adult enough to understand that, fine, take your ball and go home. But don’t spoil it for the rest of us. Photograph by Joshua Trujillo/seattlepi.com, via Associated Press. You can read more about the incident here. It seems that Greece has become the poster child for social democracy–except that the posters are being made by those who want to dismantle it. We Must Not Become Like Greece, conservative papers say as they preach the virtues of austerity. Of course, they don’t mean that we should beware profligate private sector investments and other dangers of global finance. No, no, the problems all stem from large public sector commitments backed by the foolish belief that government’s first priority should be providing for the general welfare. Instead, the road to prosperity should be one that separates winners and losers. Thus, Greece is being pushed to get on the right path, and it seems that the whole world is watching. 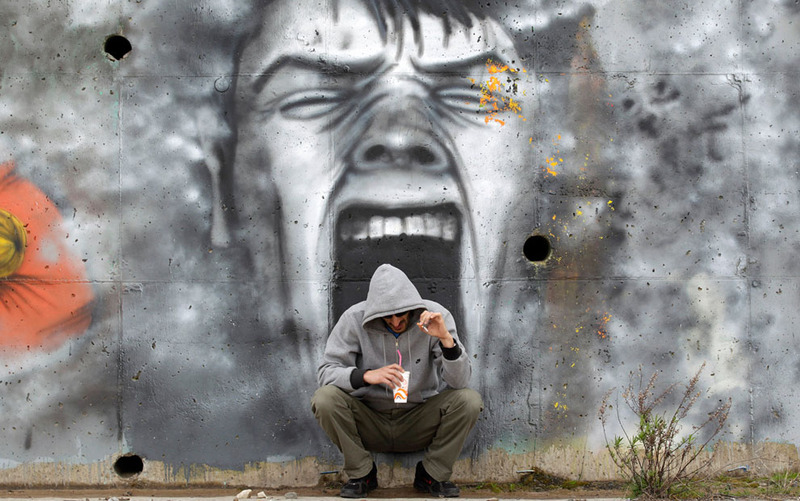 He walks along the street in Athens dutifully, a picture of anxious, unhappy resolution. The rumpled clothes don’t quite match the hard briefcase, as if he’s going back to the office on what should be his day off. He looks like austerity in motion: “I will work harder, damn it, I will work harder, and I will spend less.” Or is it, “If I work harder for fewer benefits, I might keep my job”? Or “If I try again, I might get a job, any job, maybe”? In any case, he is just passing through while the great, green eye stares impassively. Two public arts have fused perfectly here: the mural remains unchanged on the urban wall while the camera can capture how the space changes moment by moment. A man who might have seemed self-contained now appears to be small and vulnerable and perhaps disposable. An image that might have seemed idiosyncratic now can symbolize the terrible gaze of godlike global institutions. A man tries to get through the day but now is weighted with an additional burden: he has become an object to be viewed, scrutinized, and judged. In that context, the mural’s Escape key is particularly troubling, as the otherwise human visage becomes at best a cyborg and more likely a soft illusion masking a hard technocratic regime. One might hit the button, perhaps even as an act of defiance, but all that does is reset the system, not destroy it, and it will blink on again just as relentlessly and devoid of compassion as before. One eye mirrors another, just as camera mirrors computer, and so the viewer reproduces the gaze emanating from the wall. 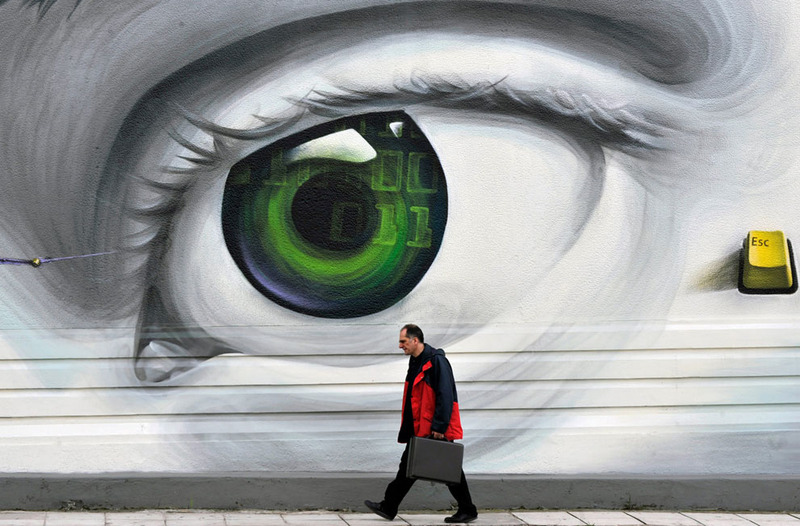 All eyes are on Greece. Caught in the glare of transparency, it is exposed to the full force of market logics. Enlisted as part of a neoliberal public demanding economization over all other values, the spectator is unwittingly complicit in an act of ritual humiliation at the alter of profit. This is the first face of austerity: the face of the global financial system that stares and judges and punishes. It is all eye, a single instrument of enormous power, and one that can stare unblinking at the storm that we call progress. But there is another face as well. This one is in Kalamatta. It is a face of pain and rage. These emotions have no one home, and so this image could be of the man’s enemy as it is about to devour him, or it could be ventriloquizing all that is pent up within him ready to explode as he is being beaten down by economic hardship. He could be merely thinking idle thoughts on a cigarette break, and unaware of how close he is to destruction; or he could be finally and willingly sinking down into that dark bright place where everything changes because there is nothing more to lose. Crouched as if waiting for the assault, his hoodie partially shrouding his face, he could be prey or predator. Either way, we are seeing the other face of austerity: the face of the suffering and violence that is its gift to the world. Whatever the face of austerity, it remains a very open question whether anyone is really seeing Greece: what it is, where it is, how it got there, and how it can continue to prosper. In fact, those questions could well be applied to any country. 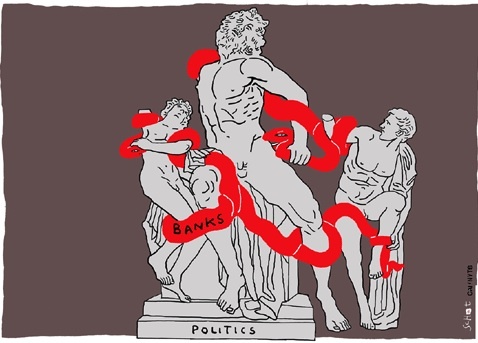 Unless economic policies are crafted with an eye to specific histories of successful public and private sector cooperation, and with concern for both global markets and local consequences, too many countries might end up wishing they were like Greece. Photographs by Cathal McNaughton/Reuters and Louisa Gouliamaki/AFP-Getty Images. Twisted metal, shredded drywall, crumpled ventilation ducts, broken cables–what was a solid, efficient building has become a rat’s nest of light industrial trash. 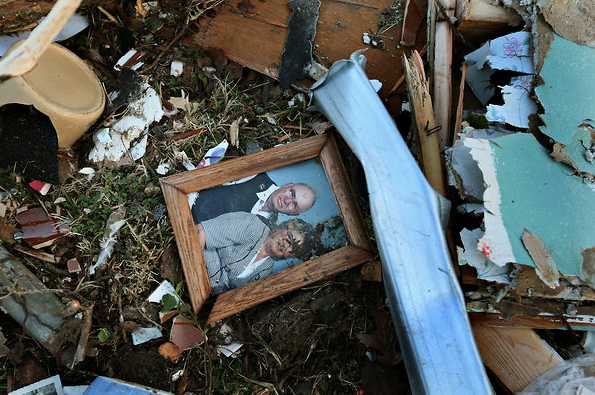 That’s what a tornado can do. The car that once was parked outside is now wearing the building, but it might be salvageable. Or the insurance company might just “write it off”–as if it could be moved out of there with a dash of a pen or a few keystrokes. But someone will have to lift that beam, just as others will have to move the chairs, the brickwork, the sheeting, and everything else that is strewn across the parking lot. And they’ll have to tear that shattered wall down and cart it away, and then begin to rebuild. None of this work will involve standing in front of a TV camera or giving a campaign speech or writing a blog post. It’s called manual labor, something that has become all but invisible in a nation that carted up too many of its factories and shipped them overseas. Marx identified how capital benefits from hiding labor, but even he might be amazed at how much of modern culture has been pitched toward abstractions, sleek designs, smooth surfaces, frictionless interfaces, and other techniques for forgetting about the work involved in making a product. Until the storm rips your world apart. When the surface is shredded, then you can see just how much structure there is in a building–that is, just how many different mechanical, electrical, and construction systems were artfully worked into a building, and how much workmanship goes into making use of the building so free of difficulty. You complain when the copier breaks–but how often does your ceiling collapse? Skilled labor and government regulation combine to make it easy to take gigantic skyscrapers for granted, as well as the many small structures and hundreds of thousands of products that we use everyday without ever having to make them or fix them ourselves. If you are skilled in abstraction, why would you know or care about how tough it can be to get a conduit to fit around a tight corner? But this discussion isn’t about the value of labor or the labor theory of value or anything more complicated than having a shot at a decent life. Because that, too, is what the storm reveals when it tears through a town. 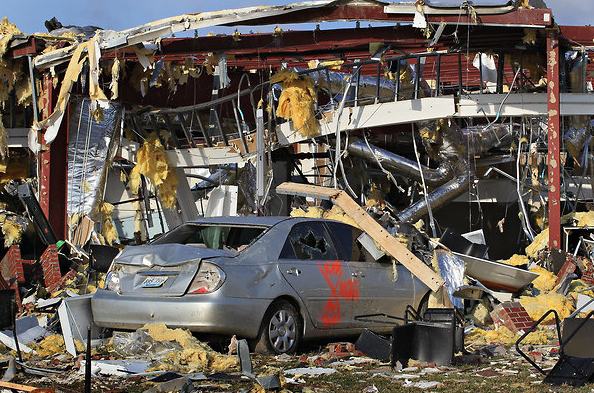 Photographs from Henryville, Indiana by Scott Olson/Getty Images. The woman above is a beggar. The scene is Pamplona, Spain, but there is nothing that marks its location per se. In point of fact, within the last six months I’ve seen the almost identical scene in New Orleans, Chicago, St. Louis, and Indianapolis. And my guess is that others have seen it in many other cities and towns as well. Or maybe not. For while such scenes are all too present we have conditioned ourselves not to notice, to be blind to the situation. Indeed, we teach our children that it is impolite to stare at such people, and I fear that we learn our lessons all too well, choosing as adults not just to avoid staring but to take comfort in not seeing them at all. The problem that is created is a vexing one, as the photograph illustrates: The poor, the unemployed, the homeless are compelled to perform their abjection in public as a means of survival, but at the same time they must shroud themselves under the veil of a shadow, seeable but not noticeable, observable but not seen. It is hardly a situation conducive to encouraging public assistance, but then that doesn’t seem to be its purpose. Indeed, it seems to underscore a public-private dichotomy that forces (enables?) us to imagine (but never really see) the downtrodden as private individuals and not as members of a public, civic community. It is a humbling lesson, but one all the more important for it if we are to recognize and attend to the precarious and profound economic differences that seem to separate us.